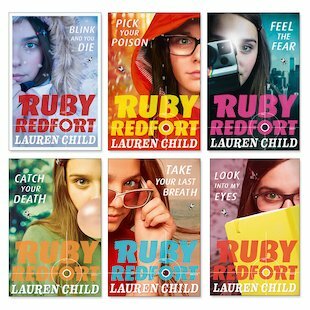 This tough-cookie sleuth makes Nancy Drew look like a crybaby. She’s genius smart and popsicle cool. You won’t catch her pulling punches. (Or missing punchlines.) Want a code cracked? A cool head in a deadly crisis? A bunch of great gadgets? A joke when things are getting tough? Forget James Bond. You need thirteen-year-old special agent Ruby Redfort and her sidekick butler, Hitch. This gutsy crime-buster doesn’t do sweet and nice. But she does make bad guys wish they’d worn nappies. If you’re a hard-boiled mystery fan, enjoy. If you’re a criminal, stay home. Simple as.